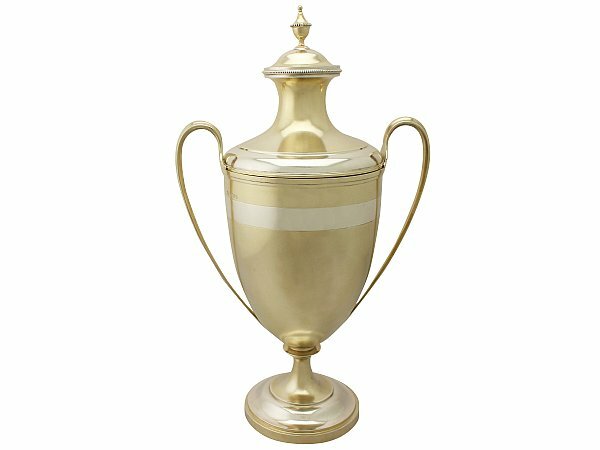 This magnificent antique Victorian silver cup and cover, in sterling standard, has a plain circular Adams style urn shaped form to a circular tapering pedestal and circular foot. The surface of this impressive presentation piece is embellished with a gilded frosted finish, accented with a broad unembellished band to the body, foot and cover. The upper rim of the cup is encompassed with an applied moulded border. 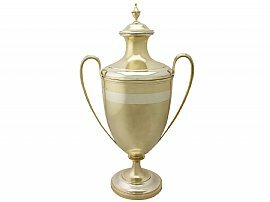 The cup retains the original hallmarked push fit swept cover surmounted with an impressive urn style finial. The cover is further ornamented with bead decorated borders to the upper portion and finial. This cup is fitted with two fine and impressive Adams style loop handles with applied moulded ornamentation to the centre of each. This Victorian silver cup and cover is an exceptional gauge of silver, exceptional quality and in exceptional condition. There are some minor surface blemishes to the original gilded surface as to be expected in keeping with age; this piece can be considered to be in presentation condition. Full hallmarks struck to the surface of the cup and rim of the cover are all very clear; the hallmarks are struck deeply due to the exceptional gauge of silver.